I have a weird habit of developing the strangest obessions. My new obsession? Online vintage clothing stores. 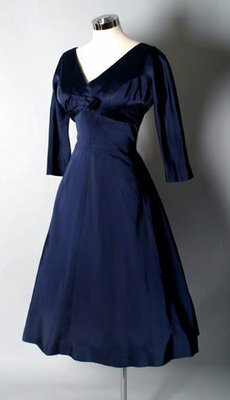 It has dawned on me I have exactly the right figure to look fabulous in those full skirted 50's frocks! I can't even believe what great stuff you can find online and at great prices. So let's answer the questions first because I am recieving them subliminally already. The sites tell you the bust, waist and hip size of the dress. I think women in the 50's must have been tiny, as 28 inches for the waist seems to be the most common size, but you can get bigger and smaller sizes. Yes, if you purchase you may have to get a little bit of tailoring done. But being a modern woman (or man) you should already have a quality tailor on speed dial. I already know you have a absolutely divine and crochety shoe guy, so if you don't have a tailor ask yourself, why you take better care of your shoes then your clothes. Next question, each site tells you quality of the material, so put that vision of reeking, moth eaten finery right out of your mind. Also, just a quick heads-up back then they actually made clothes out of quality material, you remember quality material? The stuff you can't get from the mall. Doesn't shrink or shred the first time you wash it, rarely fades, almost surely requires dry cleaning? Yes, now it is coming back to you? Excellent! That is the stuff most of these clothes are made of. Picture take from Posh Girl Vintage. Posted by Heidi Schempp Fournier at 10:38 a.m.